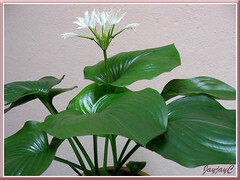 Hostas are popularly grown as ornamental plants for their attractive and beautiful foliage. But, we hadn’t known before researching for this article how extensively varied are their shapes, sizes, textures and colors! The right image, courtesy of Mark @ http://www.flickr.com/photos/markescapes/3554195218/ presents two fabulous variegated form, so beautifully colored and patterned! (Thank you Mark, we appreciate your kindness). Wow, we’re truly stunned by its diversity…browse Hosta Library’s Photo Collection (click on any alphabet displayed), and you’ll be as astounded too! Such is the ingenuity of the Divine Creator and Artist! Do you know that Hostas produce flowers that are as attractive too? Yes, they do and with a racemose inflorescence, densely covered with stunning blooms in lovely pastels of white, lavender, purple, mauve, etc. Plant type: Herbaceous perennial plants, native to northeast Asia, namely China, Japan and Korea. Features: Hosta is a genus of about 45 species of herbaceous perennial plants, with thousands of cultivars. And, there are more than three thousand registered and named varieties, as a result of extensive hybridizing and tissue culture propagation, with many resulting sports too. Hostas are slow to moderate-growing, with clump-forming or mounding (vase-shaped or rounded) habit, ranging between 10-90 cm in width and 17-56 cm or more in height. They produce rhizomes that can be short, branching and even elongated (like underground creeping stolons) as with the species, Hosta minor and Hosta clausa, and have long, fleshy roots. Emerging from the rhizomes are fabulous-looking leaves held on long petioles that usually mirror the color of the foliage. Notable for its beauty and charm, Hosta leaves come in numerous shapes, sizes, textures and colors. They can be anything, from heart-shaped, lance-shaped, linear-shaped like H. longissima, or elliptical to almost circular, ovate or obovate. Leaf blades of the hosta species and cultivars, including varieties and their sports (mutation) differ greatly too, in length and breath, and the ratio between the two aspect is as different. Leaves can be very large, medium or small. So too the leaf surfaces, can be flat, cupped, wavy, twisted, furrowed or rugose. Some are smooth, shiny and glossy or dull, others are marginally or distinctly ribbed with prominent veins or puckered, dimpled, embossed, wrinkled or crinkled. Colors of Hosta leaves range from various shades of green to bluish or greyish green and lemon, yellow to white, as well as variegated ones with color contrast of white, cream or gold, either streaked irregularly in the center or along the edge, thinly or broadly. 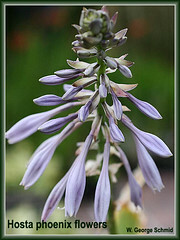 Hosta flowers are very captivating too, in various shades of purple, lilac, lavender, mauve, blue and white. Shape is as varied, from bell-shaped and funnel-shaped or bowl-shaped to spider-shaped. There are also double-form flowers and those with petaloid stamens as with H. montana ‘Yae’ and H. plantaginea ‘Aphrodite’. Generally though, the blooms are single, 6-lobed, between 2-5 cm long, can be non-fragrant or mildly fragrant, with H. plantaginea as the only strongly scented species that bears unusually large white flowers, 13 cm long. Most species and cultivars have dense racemose inflorescence on an elongated flowering scape that can be tall and erect, towering above the foliage or obliquely bent or postrate. Some species have numerous flowers, others less. Buds bloom in succession over an extended period of time, and even though the individual flowers are short-lived, lasting 1-3 days, the flowering spike remain attractive for quite a long while. Some flowers will eventually develop into seed pods containing black seeds when ripened. Not all hostas are prolific bloomers though, some may not even bear flowers and H. clausa, for instance, bears flowers that do not open but remain as buds. Quite elusive, huh! Culture (Care): Not only are Hostas easily grown, but easily cared for, requiring minimal attention. Such a delight to have in one’s garden, outdoors or as houseplants, indoors. So beautiful, durable and long-lasting. Light: Best in semi-shade, preferably with morning sun and afternoon shade. Avoid full afternoon sun that will scorch the foliage. The bluish-leaved and green ones need more shade as opposed to the gold, yellow and white leaf forms and variegated plants that need more sunlight. Moisture: Medium water regularly, with soil being moist but not soggy. Burning leaf tips or drooping leaves are indication of inadequate watering. Hostas enjoy humid conditions. Soil: Prefers fertile or organic-enriched, loose and well-drained soil. Others: Pruning is not needed, just snip off yellow or discolored leaves to keep tidy. Remove the flowering scape when the flowers are spent if uninterested in getting them to set seeds. Feed monthly with a balanced houseplant fertilizer. Repot or replant when the clumps become overly pot bound or extremely large. Relatively disease free, though watch out for foliar nematodes and Hosta Virus X, as well as deer, slugs, snails and voles that can cause extensive damage. For temperate regions: Hardiness: USDA Zone 3-9. Read about growing hostas by Ohio State Uni. Extension and Q&A at The Hosta Network. Propagation: Easily propagated by dividing the clump which is best done in early spring when the new buds start to emerge. To divide, dig out the clump, wash off all the soil and then separate them manually if possible or cut between the growing points with a sharp knife as illustrated by Bob Axmear of Hosta Library. Hostas can be grown from seed, but not advisable as seed-grown plants do not come true with original characteristics retained. Anyway, if interested, read about collecting and sowing seed by Perfect Perennials Nursery. Can also be propagated by tissue culture which is done commercially. Usage: Beautiful and long-lasting, Hostas can be mass planted in garden beds or borders in shady areas under trees, or near water features. Ideal too as ground cover plants as they can cover a wide area as clumps increase in size. Hostas are great for container gardening, located outdoors in the garden, patio, deck or porch. 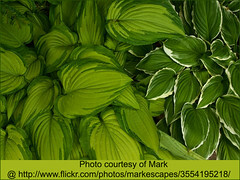 Marvelous too when Hostas of various sizes and colors are grouped together for landscaping or in mixed-planting with colorful blooming annuals and perennials. The smaller-leaved and dwarf varieties are suitable as potted houseplants or great in window boxes. The young leaves and leaf stems of some Hosta species are edible, where they are cooked and eaten in Korea and Japan. Hosta Library : do download the pdf files, a hosta ‘goldmine’ for the taking! Mr. W. George Schmid, author of Hosta Species Update had replied recently to our inquiry via email and confirmed that our green-leaf plant with umbellate inflorescence is NOT a hosta. Read about his analysis here, where he illustrated the differences between Hostas and Cardwell Lilies (Proiphys amboinensis, that’s the name of our plant). The distinct difference is the structure of the inflorescence. Left photo, courtesy of W. George Schmid, shows Hosta phoenix’s racemose inflorescence, while right one is a Cardwell Lily with umbellate inflorescence. I didn’t know we cannot have hosta – I thought it was a common growing plant. Hehe…we hadn’t known that too until we went on a merry-go-round, so to speak, searching for the ID of one of our plants that was eventually identified as Cardwell Lily, a hosta lookalike.